Add the timeless look of CAC REC-42 rolled edge american white (ivory / eggshell) dinnerware to your pizzeria, diner, or banquet facility with this 6 oz. china bowl. 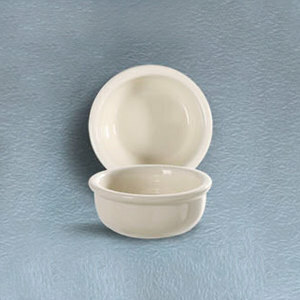 Sporting a timeless and elegant design, this bowl is sure to accent any decadent sauce you place before your patrons. The rich american white (ivory / eggshell) color complements any table setting or restaurant decor to accent your theme and make your beverages shine. The ivory color is nice on these 6ounce china bowls. They are great for serving small side orders and small portions of soup. A great buy and good quality design. These rolled edge American white China pieces have been workhorses in our shop. They are slightly off-white, and we have never had a problem with them not matching. This bowl is a nice size for a large soup or a small salad.